I'd be curious about your endgame party composition and how it compares to mine once you get there. I haven't found any good compositions to fit Acrobat or Necromancer into which is a shame since they seem really cool. I agree that a Venus staff is needed, assuming Gaia Rod is on par with Atropos' Rod and similar it will be greatly appreciated on Jenna. I found the Moapa and Karst and Agatio fights to be easier than Avimander, though I think I generally have a lower level party than you (mine was probably around level 26 when fighting Avimander) so that may influence things. Warlord Isaac, Shogun Garet, Arcanist Ivan, Pure Mage Mia, Chaos Lord Felix, Radiant Miko Jenna, Fateweaver Sara, Sea Lord Piers. Mages are built for their original element, Sol Blade on Felix, Herculean Axe on Isaac, Cursed gear on garet, Caladbolg on Piers, Orichalcon staff on ivan, Atropo Lachesis Clotho on the girls. But i'd like to try a different one this time. If you want to use class X, you can just download the txt in the opening post and search for that class. The txt lists every possible class setup that doesn't waste djinn, so it's your best bet. Gaia Rod replaces Gaia Axe so its level is 30, slightly weaker in atk than meditation rod (boosts venus power by 18). It was the best place to put it as it's exactly midway between anubis (lv 19) and ker (lv 40). Just beat Dullahan and Doom Dragon, so I thought I'd share some opinions. I love that every enemy has enough atk/powerful abilities to pose a threat as you level up throughout the entire game. I think this is what separates this version from the base game and it's done really well. However, I played up to level 25ish on my first attempt, and enemies were just too sturdy for my liking. I found myself constantly PP starved trying to heal after every couple battles, so I used the editor to decrease enemy (excluding bosses) HP by about 24% (new HP = old HP/1.3 to be exact). This felt much more manageable to me - enemies could still threaten me if I wasn't proactive about surviving, but I wasn't burning 50% of my pp on every random encounter. Though I'm also fully willing to admit I'm no pro at this game so there could easily be some aspect I'm overlooking that would nullify my opinion here. I messed around quite a bit with endgame party comps and finally settled on one that I really really like. I used it from the beginning of Mars lighthouse on. Miko - geared for venus power with Nebula wand. Beastly heals and nettle hits decently hard. Chaos Lord - geared for 100% unleash. Nothing new here. Holy Knight - geared for mercury power and PP with Caladbolg. Very tanky support providing backup heals, remedy, revive, and break. Psy Champion - geared for hybrid unleash/ailments with Excalibur, dark matter helm and shield, Demon Mail, and Knight's greaves. I was super excited to try this build out, but ended up a little underwhelmed. The unleashes didn't come often enough, and the -luck on some of the cursed gear made him extremely susceptible to condemn, seal, curse, etc. That being said, I don't think he missed a dull on Dullahan and may have been the top dmg dealer during that fight. Ideally I think the +12% crit from ninja sandals probably outweighs the ailments and jupiter power on the Knight's greaves, but I didn't feel like going back to pick up another set of sandals. White Mage - geared for mercury power with Clothos. She got shorted 1 djinn each from venus and jupiter, but she's still so good with powerful group heals and prism/plasma. Fury - geared for jupiter power and PP with Nebula wand. I was surprised how much I liked this setup. He hits really hard with his psynergy, but needs a lot of PP recovery or will burn through his pool quick. Radiant - geared for resistances and some mercury power with Rising/Alecto's mace. An even tankier version of Holy knight Piers without remedy. Arcanist - geared for mercury/jupiter power with Clothos/Lachesis. Versatile healer/dmg dealer with wish/plasma/ice. Nice party comp MomongaMan, though there are a 2 things that i'd like to ask you: for Piers and Ivan, why did you choose Caladbolg instead of Rising Mace and Nebula Wand instead of a weapon with more attack like a dagger? I think Fury's main selling point is the attack stat so i find curious keep using a staff in that class. Also, about the 2 djinn missing, did you check the txt in the opening post? The one that lists every possible party comp that doesn't waste djinn. Anyway, I really hope you enjoyed your playthrough. Caladbolg over Rising Mace: I forgot to mention another little tweak I made when I reduced enemy HP - I added +15 elemental power of their respective elements to the "big 4" long swords. So Caladbolg provides almost as much epower and much more attack than rising mace. Nebula Wand over light blade: I see the main attraction of fury being the wide variety of very powerful psynergy it has access to, and nebula wand was the only way to boost the epower of all 3 types. I was aware of the class lists you posted but I didn't consult them when working through my setup. I wanted the satisfaction of finding out what I could come up with on my own rather than copying from a list, if that makes any sense. Anyway, thanks a lot for all the work you put into this project. TBS/TLA were already among my favorite games, but this makes them so much more engaging. Ok now it makes sense. Though it completely defeats the main selling point of maces, so it's something i'd never do. This patch is amazing, Caledor. I'm going through TBS right now and I'm loving what I'm seeing. I recently grew nostalgic over the Golden Sun series and wanted to play through the game again after many years. I always loved the class system but I hated how the games were never difficult enough to actually make you have to use them. I was trying hard mode in TLA and, while it was interesting in the beginning, it just kind of became tedious after you got enough djinn to start experimenting with the classes. It wasn't really difficult, battles just took longer and you had to heal after every battle. Golden Sun Reloaded seems to be more balanced in this respect, as the bosses (with their extra turns, oh my) are actually fun and interesting. I'm going to be playing through both games back to back, so I figured I'd comment my experiences and impressions with the game as I progress. But after I got the 4th I switched around my party to be the following for the Hydros statue and, probably, the rest of the game. I think they were well balanced for a first boss encounter. I had given Flint to Ivan so I could have 2 healers during the fight, but I ended up not needing to heal much at all. I still had starting equipment on everyone (everyone is lv 4), but given what I had read from everyone on this thread I was surprised with how fast they went down. This guy really surprised me. I was not expecting him to have 2 turns. At this point I had everyone around level 6 with all the Djinn available so far. I, for whatever reason, did not take the psynergy crystal up above to heal, so almost everyone had around 30%-40% of their PP when I fought Tret. I had to restart this fight 3 times since he would end up just double casting his sleep spell and immobilize my entire team for several turns at a time. In hindsight it would have been useful to have some elixirs to counter the sleep with the (usually) 1 awake member I had, but at that time I only had 1 elixir and that member would always be the one who fell asleep. This was the first time in the series where I was intentionally using all the djinn on Issac to switch his class so he could start using cure, which gave me a giddy feeling. That's exactly the situation I was looking for in this mod and I'm happy I got to experience it so soon. Ultimately, the MVP of this fight for me was the healing ring you found in this dungeon. Eventually, I just had to have Issac use it every round to keep everyone alive until Ivan finally woke up and could start healing again. As a side experience, the Djinn in this dungeon was a huge pain in the F$@king @#$. He would consistently run away on the second or third turn, and no matter what I did I just could not kill him before then. I summon rushed, I spammed djinn, and swapped around all my character's classes, I messed around with the RNG, over and over and I just could not get this guy. After about 15 minutes of trying eventually he tried to run and failed, to which I spammed him with summons, he lived, and then he tried running again and succeeded. I had to leave the dungeon and come back to actually get this guy. He tried to run again, of course, but this time he failed every time he tried. Thank. God. This was, no doubt, the most frustrating part of the game for me by far. After fighting Tret, Saturos was a little bit disappointing for me. 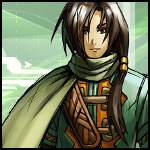 He felt like a buffed up average enemy: he doesn't really pose a threat to my party, he just takes a long time to deal with. With an extra party member and 2 dedicated healers in my party now, there was no danger of wiping. I just did a basic strategy of using all my djinn then summon rush him, rinse, repeat. This guy did SO much damage. I was around level 12 with everyone and I didn't pick up any armor from the village near Tret since I didn't have enough money to upgrade from Imil. There were several times where I would fully heal someone to full hp, the Boss would attack, and that member would be left with ~ 12 hp left. And he still had another turn after! This was a long, drawn out fight, with me constantly healing every turn and switching from offense and defense, but surprisingly I only lost 1 member (Issac) through the entire fight, and it was literally on the last turn of the battle. Was a little upset at that but I didn't feel like redoing the entire fight just so I could have everyone's experience around the same level. Up until now (besides Tret's sleep bs), this was the first and only time in the run someone has died. The typical living statues in the Altin Mines were mostly annoying, and reminded me a lot of Saturos. They don't actually provide any danger to you, their entire purpose seems to just whittle down your resources to make fighting the boss more of a challenge, but the problem with them is the dungeon is segmented, meaning you can easily recuperate at the inn after you fight them. In fact, the segment you actually fight the boss doesn't even have any living statues to begin with, making their overall tankiness just an annoyance rather than a challenge. They either should have had more damage to make them an actual threat, or they should have had a lot less health to make them less of a tedium to fight, since you have to fight 4 of them. It was at this point I was able to have 4 , meaning i could now have wish on one of my member. I chose Ivan because he is much faster than Mia. This boss is what the living statues should have been, imo, just with more hp. With Ivan healing with wish basically every turn, however, there was absolutely no danger of dying. I had to use a few of my mountain waters (20 pp recovery) on Ivan through the fight, but ultimately with him on heal duty this was just a battle of resources and I had more than the boss. This is ultimately what happened in TLA's hard mode. As soon as you get wish the game just becomes laughably easy. If I didn't have wish for this fight I suspect it would have been an actual challenge given how much AoE he had, but since I did all I had to do was make sure Ivan had enough PP every turn. And because the boss had no stuns or sleeps (god dammit Tret) there was literally nothing to worry about. I'm really hoping Wish doesn't trivialize the rest of the game as it did this fight. I appreciate the increased PP cost of the move, but because you also increased the Base PP of everyone (to make psynergy more powerful, I believe, since max pp now influences damage scaling of psynergy) that kind of negated the increased cost of the move. We'll see what happens. I like what you've done with the game. I think swapping around the psynergy of some classes is a fun idea (I'm not sure I agree with removing whirlwind from Ivan's base psynergy though. That was weird), though I'm sure I won't really come to appreciate it until I get to see Felix's and Sheba's new classes in TLA. I'm a bit torn on normal encounters, though. They remind me a bit of TLA hard mode where they are just an annoyance rather than anything substantive. I justify the increased hp pools by telling myself it's to use up my resources in dungeons for the bosses, and as a result I rather like them when I'm in dungeons. But in areas without any bosses to fight enemies like this are just a complete chore. I kind of agree with the other poster here who ended up reducing normal enemy's hp by 24%. I would do that for overworld enemies, but I think I would keep enemies located in dungeons as they are. As the enemies are now, the entire game just feels stressful in a way. Part of me keeps expecting the game to let up a bit and let me just relax, but I haven't really felt that yet. After every fight I either use up a ton of psynergy to end the fight quickly or I conserve my psynergy and take a lot of damage and have to heal it back up immediately. Sometimes not having to requiring using resources every fight is nice, but that's probably the nostalgia of the vanilla experience talking. I'm noticing the increased power of psynergy too and i'm loving it. It's great having a reason to use them over regular attacks. However, from an emotional standpoint, I'm mixed with it because I grew up with these games with attack being the end-all-be-all tactic to use, and to have all 4 members attack an enemy and not kill it is annoying. It makes me feel like there's no reason to attack and to just spam psynergy, which logically speaking makes sense - regular attacks that use no resources shoudn't be as strong or stronger than psynergy that does require resources - but it'll take some time to get used to. Overall, I'm really happy with what you have done. As I said, I'll be binging through both games back to back so I'll update with anything noteworthy. Thanks A LOT for the detailed reports, i really appreciate the effort and i love reading those. Ivan lost whirlwind cause i split the "focus" of each character in their element to differentiate the main classes. Ivan is Jupiter's thunder while Sheba is wind. Same happened with Venus (Isaac's Rock vs Felix's Plant), Mars (Garet's Blast vs Jenna's Fire) and Mercury (Mia's Ice vs Piers' Water). Actually Ivan had only Whirlwind, without the other 2 tiers, for a long time for ease of use, but at some point i gave him the 16th psynergy and thus lacked the space for whirlwind from that moment onwards. I don't think i increased PP overall. I did increase base PP and HP but i always compensated somewhere else. Lower class multipliers for PP and less HP from djinn for example. Hope you'll enjoy the rest of the game and TLA like you did so far. All right, I just finished going through all of TBS. Similar to my last post, I'll detail my thoughts on each of the major sections and then give an overall impression after. This setup was the obvious route for me since it's pretty much the only one that gives my party 2 wish users. Mia can also get wish from her and classes, but Ivan needs the . I was debating giving Mia instead of Garret, but once again, when I saw you removed revive from the Chaos Lord class that and share there was really no point in having 2 of them. As a result, I really felt like I was pigeonholed into this specific party comp. The enemies and bosses (especially) did so much damage that I just couldn't justify not having 2 wishes. And with also having the full cure series, the revive I was expecting to have, and better stats than her default Angel class there was no reason to not have her as a Guru. One of the goals of this patch, I thought, was to give players a reason to explore the class system and try new tactics they didn't have to in the vanilla game. This is why I thought you had moved some psynergy around and themed the characters to differentiate them from one another. However, my impression from playing through the game was that class diversity was actually hurt as a result of the balance attempts. As I stated before, the enemies do so much damage that you really need 2 healers in your party. And since nearly all the bosses have multiple turns with aoe potential having wish is just the best and ideal solution, especially when one of those classes has both wish, cure, AND revive. The difficulty of the game basically requires you to have as an Arcanist and as a Guru, at least if you want to have a smooth run. At this point I had 4 , so Ivan was now a certified Wish user. With Ivan healing every turn and Mia topping off or supporting with Granite every now and then, my party never came close to dying. This was a fairly smooth and uneventful fight, actually, and with the 2 psynergy crystals in the previous zone I came into this fight pretty much in perfect condition. From reading through this thread I had noticed quite a few mentions of this boss being quite a big difficulty spike from the game up to this point, so I was expecting hell going into this. And while he did do a ton of damage, I was also savvy enough to pick up the 2 , , and before this area. This meant that in addition to Ivan, Mia could now also use Wish. Having those 2 work together on healing duty and Issac + Garret just cycling through djinn -> summons was more than enough to clear the fight with little difficulties. I think 1 character went down during this fight, but he was easily revived immediately after. I was really nervous going into this. This is where you have to use Issac alone, and given the HP and Damage boost enemies have I was worried I wouldn't have enough sustain to do these 3 fights consistently. Before then, though, I got a bit peeved at your balancing attempts for the classes. In the first challenge, you have the option to help Issac complete the obstacle course faster by using Move, Douse, and Growth. However, you removed any possibility for Mia to get Growth, and since Garet is the only one who can learn it while also being the only one who has move of the 3 helpers, there is absolutely no way to cheat all 3 areas with psynergy. Admittedly, it's not that big of a deal since you still have more than enough time to get every chest and make it to the goal first, but it was still a bit annoying and noteworthy. It was this event that made me start feeling like a lot of the balance changes involving psynergy were a bit unnecessary on your part and done more so for flavor than actual balance. Anyways, as for the 3 fights themselves, giving Issac his trusty so he can have cure proved to be more than enough to handle all 3 fights. The third guy was doing a ton of damage every turn and was making me worried, but when I gave in and decided to use the bombs the game gave me the fight suddenly became a cakewalk. Honestly, not much to say about this fight. 2 Wish users and Djinn + Summons was all that was needed here. No one went down and nothing besides poison (which Mia could cure) to worry about. Fight dragged on longer than I feel it should have though. At this point I realized I could use Ember to restore my party's PP and then reset him after each fight, thus giving me effectively infinite PP for healing. By the time I got to the boss I was at pretty much tip top condition, despite fighting pretty much every Tornado Lizard in the area. The Storm Lizard did a lot of damage, which is somewhat par for the course, and my characters got below 50 hp quite a few times during this fight, but with the power of double wish I managed to not lose anyone throughout the entire fight. No status aliments to worry about. No real difficulties to note. At this point I, of course, had every single Djinn and pretty much the best in slot equipment aside from Issac's Gaia Blade. What made this fight manageable for me was being able to use Djinn on Ivan and Mia and not have them lose their Wish spells. He honestly was not that bad until the second half of the fight where he started spamming sweep on the same characters over and over. 3 of my characters went down in total during the fight. 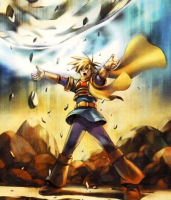 Issac went down first, but With Garet casting Kite on Mia she was able to revive and then full heal Issac back to full the following turn. Then Mia and Garet both went down at the same time due to a double Sweep from Deadbeard, but since my team has 3 characters that can revive (2 Djinn + mia), I was able to get both of them up the following turn too. And, luckily, Deadbeard decided to play nice and just buff himself that turn while I recuperated. Ivan and Mia were getting really low on PP so I used my first 2 psynergy crystals on both of them using a Kited Issac (who had the crystals), but in 2 turns Deadbeard died so it was a total waste. Sigh. These 2 had a ton of hp, but they didn't feel that threatening at all. Menardi stuck to trying to cheese me with Death scythe pretty much every turn (but it never worked, thank god), and Saturos alternated between fireball and attack mostly. I spammed djinn and summons on Saturos first, and 2 years later he finally died. Menardi by herself was barely a threat that I decided to just recuperate by recycling all my djinn and just attack her until she died. Mia was enough to heal anything she could do with her eyes closed. He had a ton of Aoe and liked spamming outer space on me every other turn, but yet again the power of 2 wishes came out on top. I think at one point he killed Issac by using a move that automatically puts a character at 1 hp and then did an Aoe to attack everyone like an @#$, but it was a simple revive procedure to get him back up. Other than that, he went down much faster than the duo before him. Ivan also got low on PP from constantly healing so I threw him a Psynergy Crystal, but like with Deadbeard the boss died a few turns later, making it another wasted item. Sigh. Overall, I had a lot of fun with this. This was definitely a different experience from the vanilla game. The game was kind of stressful in the beginning, as I noted in my first post, but after obtaining Wish that feeling went away mostly. It was still annoying to have Ivan have to heal after every battle, but after Mia got Wish herself the game suddenly got A LOT easier. I mentioned it up above, but I want to restate it here, I think there is still some issue with the balancing in this game/patch, and perhaps it's not something you can address. Wish is such a strong move that it pretty much trivializes much of the game. However, when you make enemies have so much hp and deal so much damage you basically force players to take it. And this is why I felt like I was stuck in the one party comp I had at the end. Anything else just isn't as efficient, you really want to have 2 wish users and a revive (just in case). Ultimately, I ended up playing the game the way I usually do: Have 2 dedicated healers and then just spam djinn -> summons on bosses. The only difference being I had to heal pretty much every turn as opposed to only every 2-3 turns in the vanilla experience, thus making fights last longer not just because of the increased HP pool. Part of me wanted to experiment a bit with aliments and using buffs/debuffs, but I didn't really need to, just like vanilla. After getting all the Djinn I got really curious about how TLA is going to work though. With more Djinn and characters a lot more class options are likely to open up and my problems with the balancing in TBS might be alleviated there. With the 7 Djinn limit, though, the game feels somewhat incomplete to me. That might just be my familiarity with TLA talking, though. One thing that I really have to applaud you for in this patch is making the bosses actually feel like bosses. They feel like an entirely different beast from the regular enemies, as they should. In the vanilla game you could pretty much fight bosses the same way you would fight normal enemies. In fact, the last several times I've played the GS games I decided to never use any djinn or summons since they made the game so easy. The bosses in this patch, though, were tough enough that I felt like I needed to use the djinn to have a chance. I could probably beat most of the bosses without djinn or summons, but they would be a very, very long fight without them. I'm glad I found this patch, but at the end of the day I'm feeling exhausted from the whole experience. I can't say I've ever felt tired from playing GS before, so I'm still deciding whether or not that's a good thing or a bad thing. But I would definitely recommend this patch to anyone who thinks the GS is too easy. Thank you for making it! I'll be starting my TLA Reloaded run within the next few days, so I'll post my thoughts on the game when I make some decent progress in it. @Wish & difficulty: i think the overall difficulty is more or less TBS hard mode. This might have given too many HP on enemies since in TBS they're already stronger than in TLA. so i'm considering cutting 10% of HP to everyone. About wish, Isaac's Protector also has it. @Guru: Mia had wish in every dual class. For the sake of variety, either this or Druid had to lose it. @TLA. The mod was tailored for TLA, where i focused especially on endgame variety, so it's well within my expectations that TBS might feel underwhelming. Again thanks a lot for playing it and for the huge report, I hope you'll enjoy your TLA run! I also just finished playing through TBS Reloaded, and I ended up taking a similar class setup as Malyck did, with Ivan having the Venus Djinn before getting Mia, and then swapping them for Mercury after the lighthouse. Before going to Kolima/Tret, I did make a brief detour into Bilibin Cave to snag the Elven Rapier for a much-appreciated increase to my damage output to help get through the forest. 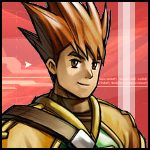 I ended up not using Djinn or summons, though, and went for a strategy of Bravery/Impact on Isaac/Garet, use Ragnarok/Planet Diver/Astral Blast, with Ivan's priorities being to heal, use Dull/Blunt/Resist, or just use an attack spell. Mia simply healed or used an attack spell when everyone was healthy. This took me through most of the boss fights with no major issues. Once I had the "endgame" gear and Isaac was loaded out with the Gaia Blade, Warrior's Helm, Asura Armor, War Gloves, and Hyper Boots, he stopped using any Psynergy beyond a Bravery at the start of a fight, and just used basic attacks and Titan Blade, which hit Deadbeard for about 500 damage on each TB, and 3-400 against Saturos & Menardi and Doom Dragon, depending on how recently they used Break. Deadbeard was taken out at level 28, which leveled everyone up to 29, and by the time I climbed back up Venus Lighthouse, Isaac, Garet, and Mia were 30, then Saturos & Menardi gave Ivan enough experience to hit 30, also. The Saturos and Menardi fight had somewhere around 4 Death Scythe/Size actually connect, downing Garet 3 times and Isaac once, but Revive and a Nut got them back up and going again each time. I've started TLA now, and I don't know if it's just the enemies themselves, or the lack of a second warrior instead of a second caster, but enemies take about 2 rounds of auto-attacks, barring unleashes, or a round of spells, before going down, and I tend to end up needing to Cure everyone after a random encounter or two, even with a full set of armor from the shops and what little treasure armor is available at the start. Things seem to hit really hard right now, especially Skeletons with Undead Sword. Admittedly, I'm not even level 10 yet, about to head out to Yampi Desert, so that may change soon. Overall, I'm having a great time playing through this update, and I can't wait to get enough Djinn to actually get into the classes and take down some superbosses. Hi ReploidX welcome aboard and glad you're liking the mod so far. About TLA, what you described is perfectly normal. I'm positive i literally ported enemy stats from TBS so the blame is entirely on the "second caster instead of second warrior". Longer fighter in turns implies more damage taken which implies more healing needed and so on. Hope you'll enjoy the rest of TLA as well! Well, TLA's been pretty great so far. I've got my Trident now, and it's time to take down Poseidon. The last two bosses, Serpent and Avimander, went fairly well, using the same basic class setup as in the first game. Jenna's got all Venus Djinn, Felix has Mars, Piers with Jupiter, and Sheba with Mercury. Near the end of each fight a few characters ran out of Psynergy, and I actually unleashed some Djinn for the last round or two. Poseidon, though, seems a bit further out of my reach than either of them did, with his 3 actions and the "set to 1 HP" attack (Ocean Fist?). I'm level 27, so I might just need to grind a few levels first. Looking at various treasure lists, I have all the major treasures so far, so I don't think I'm under-geared. Then again, the item classes might have something I overlooked, because I never used them before, so I have no idea what they actually do. Yo, incredible hack you made dude. Played a vast part of the first GS, but my save state messed up, so I'm just gonna play the TLA one now. Question: Do all the djinn appear? Cause for all i know, you needed to transfer data from the first game in order to have ALL the djinn in the series that far. Other than that, incredible job, and i hope you keep it going, cause I'll sure try it. Thanks Megalord, and sorry for the late reply. All i can say is that Djinn requirements are the same as vanilla. Without a password you'll find some extra GS1 djinn exactly like vanilla TLA but you won't have all of them. So far so good, although the Gabomba Statue was a really hard dungeon despite the full party being available xD. A have a question though: In you class chart document you shared in the download link there are some red numbers, is it just my computer being crap or does it have a meaning?